Occasionally, while mired in the middle of some writing some turgid paper on the economic ramifications Treaty of Maastricht or an equally-engaging area of the dismal science I would get distracted and get creative with my queries in my school's academic journal database. I would look for strange articles about football (turns out there are quite a lot) in hopes of avoiding my mind from completely going numb. I quickly reached the conclusion was that despite the best efforts of econ professors everywhere to dissuade me of the notion, academics sometimes actually studied interesting topics. Certain fields have generated a considerable amount of volume, and it turns out that the field of humor studies is no different. 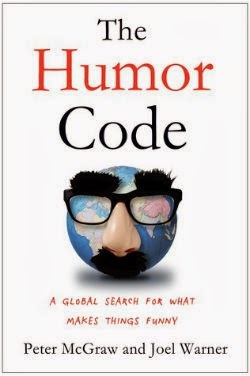 In The Humor Code: A Global Search for What Makes Things Funny, a writer published in Wired, The Boston Globe, and Grantland teams up with a marketing and psychology professor to identify the scientific, sociological, and cultural factors behind what we find humorous. Equal parts travelogue and pop-science examination, The Humor Code manages to be an amusing and informative read on what makes us laugh. The book grew out of a series of articles Warner wrote about McGraw including a feature in Wired and the book reads like an extended magazine article. Thankfully, there is enough substantive material for the book to succeed with the extended format. While McGraw and Warner are both listed as authors, it appears that the journalist Warner is the one behind the keyboard chronicling the pair's exploits. Warner and McGraw traverse the globe to codify the elusive concept of humor. They visit locales such as Tanzania (to research the great 1962 Tanganyika Laughter Epidemic, Japan (to examine those ridiculous game shows where many comedians act as contestant), and Scandinavia (investigating the fallout from the Muhammad comics). Closer to home, the authors also attempt to determine how to win the New Yorker caption contest and consult with some strange characters including Lisette St. Claire, the "laughter queen of Los Angeles." Their journey culminates in McGraw attempting to apply his learnings by performing at the Just for Laughs comedy festival in Montreal. The Humor Code also contains a bit of intellectual heft and reviews several items from the surprisingly abundant volume of humor research. McGraw is at the vanguard of the field as the direct of the Humor Research Lab (HuRL) and is a proponent of the "benign violation" hypothesis of humor, which strikes me as intriguing yet not entirely airtight (though my economics background puts me firmly within a glass house in that regard). The book covers studies about whether Democrats are funnier than Republicans and even conducts some original research, such as analyzing New Yorker caption contest winners. These segments were the highlights of the book for me and helped The Humor Code become more than a collection of fascinating and odd anecdotes about their travels. I found The Humor Code to be a very enjoyable and fun read. It probably wont make you any funnier (which is not the book's intent in the first place) but it will yield some fascinating insights and strange anecdotes about global humor. The book has a light feel and despite a few weak sections and disappointments (such as a rather wasted interview opportunity with Louis C.K.) it is one of my favorite books of 2014 thus far and highly recommended for anyone interested in psychology or what makes things funny. The Humor Code is an original, engaging, and oftentimes illuminating pop psychology book about what makes us laugh and why. Recommended for those seeking a light science read with some observations on global culture and, of course, humor. There are now plenty of online and literary resources analyzing rap music. These all seem primarily focused on content: metaphors, references, general subject matter, and the like. Some musical elements, however, don't particularly translate well to the written page/link-baiting website, namely delivery and flow and how those words actually sound. 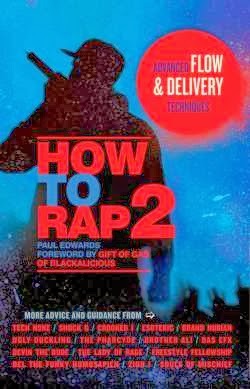 Paul Edwards' sequel to his 2009 book How to Rap attempts to fill this gap and does quite an admirable job. Similar to the first installment of the series, How to Rap 2: Advanced Flow and Delivery Techniques consists of a series of insights from rappers past and present opening up about their craft. This volume is completely based around flow and delivery. While it seems to be aimed squarely at aspiring rappers (and it is undoubtedly a valuable asset for that audience) there is plenty to like here for the general hip-hop fan on how to appreciate the music in a new way. The book culls from over 100 interviews with a broad range of emcees. Edwards gets to the pick the brains of the likes of Chuck D, Big Daddy Kane, Aesop Rock, and E-40, among many others and the lineup truly runs the gamut of popularity and (American) geographic region. Most rappers are incredibly revealing about their methods and techniques. Highlights include Evidence from Dilated Peoples describing how the three-bar loop of "Worst Comes to Worst" and how Gift of Gab records and memorizes his rhymes to allow him to play around with delivery in the recording booth. Edwards is also far more than a silent transcriber, as he includes a plethora of flow diagrams (example pictured below) to illustrate his points and is able to mention abundant examples of the advanced techniques referenced in the subtitle. Some of his especially enlightening contributions include outlining how Nas links rhyme schemes on "N.Y. State of Mind" (very smoothly and cleverly, it turns out) or how Gift of Gab has to alter his rhyme scheme on the 3/4 beat of "Chemical Calisthenics." The ubiquitous flow diagram. Also gas face to the herb reader who doesn't know the song referenced. How to Rap 2 is split into three main sections. The first concerns advanced rhythm techniques, including placing rhymes within bars, triplets, and punctuating different beats in bars. The second section covers vocal tones, delivery, and timbre, and the final portion goes over rhyme schemes in a more complex and comprehensive manner than the first How to Rap. Some sections are actually groundbreaking, such as Edwards' application of the "flam" concept (think DMX on "Who We Be") in percussion to rap flows. Rappers have been using this technique for quite some time but this is the first time someone is actually classifying and naming it. Often times most discussion about a rapper's flow begins and ends with a statement like "he sounds like he could flow for days." How to Rap 2 is able to give names to many methods that lead to entertaining flows and delivery along with rappers explaining how they employ such techniques. The book concludes with an index of consonant and vowel sounds to practice enunciation, which is the only portion that non-rappers might conceivably skip (though I did like guessing to see what songs would be used as examples). How to Rap can essentially be seen as an introductory course into the craft of rapping, touching briefly upon all basic elements. Its sequel is more like "Advanced Topics in Rhythm and Delivery," expounding upon the more general flow and delivery content from How to Rap. The rapper interviews appear to all be from the same session that yielded the first book, but re-hashing is kept to a minimum and most of the book covers new territory. I also don't have any issue with assembling these journalistic b-sides into a new book, as it would have been a real shame if they never saw the light of day. And the fact that Edwards was able to create a 200-plus page book from interview snippets about one specific topic makes me excited for future installments in the series. While the author does occasionally fall victim to beating home some rather straightforward points (I think its a bit of explanatory overkill to mention that Pharoahe Monch ends a bar on "Maintain" with a low pitch because "the MC is serious and talking about a serious subject") and I don't entirely understand the frequent references to page numbers of the first How to Rap given that almost every flow and delivery topic is covered more in-depth in this current volume, these are minor quibbles. Ultimately, How to Rap 2 is a fun, fast, and enlightening read that is really essential reading for any aspiring rapper or fan of the genre. It explored new elements of the genre that made me want to return to albums I had listened to a thousand times already to explore their rhythmic and tonal elements with a new perspective and vocabulary. Anyone looking to delve deeper into the rhythm and sounds of rap owes it to themselves to pick up How to Rap 2, especially if you enjoyed the first book. The rappers are all remarkably candid and insightful about their processes and Edwards is an excellent guide through the realm of rhyme schemes, vocal tones, and complex rhythms. Fans should not be dissuaded by the title, as there is plenty to like for anyone with an interest in hip-hop can learn and appreciate a lot from this book.